After an annus horribilis for their 2016-17 financial year, in which they experienced multiple outages, the ATO has announced a radical shake-up of outsourcing processes that will see them split IT contracts into smaller, and more targeted bundles. In a blog post published this week, ATO CIO, Ramez Katf, talked up the move, saying it would allow the ATO to utilise the best providers for specific service areas and to ‘ensure we’re engaging the right expertise’. The process is expected to be gradual, with tendering expected to roll out over three years determined by existing contracts expiring and evolving business priorities according to Katf. The move comes after criticism of outsourcing expenditure which peaked at AU$330 million. The Australian National Audit Office (ANAO) published a report into the outages that was critical of the ATO’s vendor service agreements, and their utilisation of the cloud. Just days after the first outage took out the ATO’s online services in late 2016, the ANAO report reveals that the ATO began to set up cloud computing contracts in the form of three separate agreements with Macquarie Telecom, Microsoft’s Azure and Amazon Web Services. Since then (and eight reports later), the ANAO has recommended that ATO reassess its service commitments with the cloud vendors. The ATO attributed the bulk of their expenditure to fixing 2016/17 outages which required significant work and the deployment of additional resources. The ATO also indicated last year that they expected outsourcing costs to ‘trend down’ with outsourcing costs to peak at AU$280 million over the 2017-18 financial year. Regardless of timing, the ATO’s move is also a response to the ANAO report, with the announcement that they are to split outsourcing into smaller bundles representing the biggest shakeup of their IT outsourcing deals in the last 10 years. Another factor figuring prominently is the federal government’s stance on procurement. They have capped IT contracts at AU$100 million, setting a duration of a maximum of three years for IT contracts. Katf has said the move to smaller contracts that are ‘more granular and potentially shorter in duration’ and would most likely see deals with a ‘smaller scope of services’. 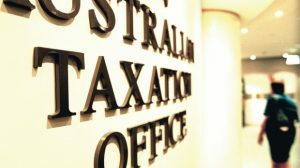 The move comes as the ATO seeks to finalise several key work streams in the coming financial year, the first of which is understood to include a replacement online portal for tax agents. Either way, they are likely to have their hands full. The ATO currently runs over 100 applications, 2,000 servers and manage two petabytes of data… Sources within the ATO say they managed over 6,500 system changes in their production environment last year.